Spinning is a group cycling class. It's a relatively recent trend of exercise, where participants take part in a group workout, positioned on stationary exercise bikes. The workout typically lasts anywhere between 30 to 75 minutes. Spinning classes are done in a fitness studio, with various light music settings to create an energy-charged atmosphere. Instructors guide participants through workout phases- warm ups, steady up tempo cadences, sprints, climbs, and cool-downs. 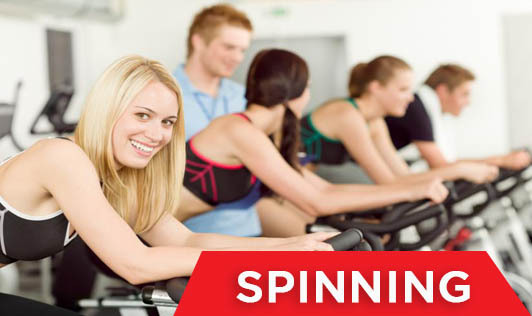 Spinning classes can be a great way to introduce a vigorous workout for burning calories and keeping muscles in shape. Spinning is a great cardiovascular workout. It burns calories. A good 30-minute workout on a spinning cycle can burn as much as 500 calories. It improves muscle endurance. This is characterized by doing consecutive muscle contractions for a long period of time. When you use a spin bike at moderate intensity, you can increase the muscle endurance in your legs. It is a low impact exercise. Spinning keeps the pressure off your knees and feet. You will be able to work out hard on a spinning bike without hurting your knees and feet. It shapes your legs. Spinning uses large muscle groups of your legs. It does not take long before your thighs, hamstrings, and calves begin to tone, strengthen, and shape. It is a good ab workout. During a spinning routine, the movement from a slightly bent position and side to side works both the central abdominal muscles as well as those along the sides of your abdomen. It improves posture. When you work out on the spin bike, you need to engage muscles in the hips, trunk, and shoulders to stabilize your body. This will improve your posture and your balance at the same time.